Rotork has completed a contract to supply fully automated pneumatic control systems on high capacity biomass rail freight wagons supporting the decarbonisation project at Lynemouth Power Station in Northumberland. 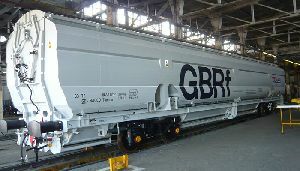 Rail freight manufacturer Astra Rail/Greenbrier Europe and leasing company Nacco have supplied GB Railfreight with 50 hopper wagons to support the biomass haulage contract awarded by Lynemouth Power Ltd. Each with a payload of 70 tonnes, these auto-loading and discharging wagons run in two rakes (coupled groups) of 24 between the Port of Tyne and Lynemouth Power Station, delivering 37,000 tonnes of biomass per week. The Rotork design for auto-loading and discharging enables all controls, hand valves and visual indicators to be located in one place, providing safe and convenient access. Top and bottom hopper doors are operated by a magnetic sensor valve from a lineside magnet. The innovative design allows any wagon in the rake to be the arming wagon. The fully automated control system enables quicker loading and unloading, requiring only supervision without manual intervention during operation. The proven design also allows for wagons to be separated and used in other rakes without any further configuration. Lynemouth Power Station has generated electricity since 1972. The plant was originally built and operated by Alcan with the purpose of providing safe and secure energy for the production of aluminium at the adjacent Lynemouth Smelter. The station ceased burning coal in 2015 and has now been converted to burn sustainable biomass, enabling the supply of up to 390 megawatts of low carbon electricity to the National Grid, enough for 450,000 homes. Find out more about Rotork Instruments rail industry solutions here.